Sure, retro bargains are sometimes hard to find. But that doesn’t mean you shouldn’t look. I’m not that far removed from a very interesting week spent in Japan, in which (amongst many other things) I indulged my passion for retro gaming. That’s a topic fully for another day, but one takeaway I did glean very quickly is that the days of real retro “bargains” are all but over. OK, have it your way…. anyway, something tells me that a console that costs you around a dollar and is sitting in a drawer labelled “junk” probably isn’t going to work. I’d resolved myself to playing them through emulators, given that legal cases around original PS1 modchips make them a big no-no to import… and in any case, their heyday was two full decades ago! 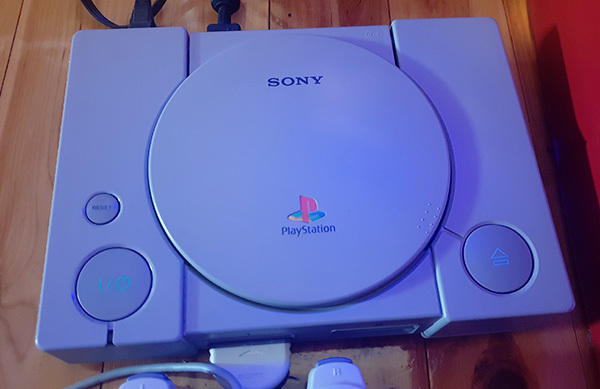 Then on the weekend, I was indulging in a little op-shop browsing when I spotted an original PS1 sitting in a corner. It had been tested (clearly this is an op shop with a friendly resident sparky onboard) and claimed as “working”. My own model is a PSOne — the type with the screen, although that’s gone all wobbly on me. Anyone know of a fix? Heh. It just occurs to me that what’s basically wrong with it is the… Vertical Hold. No, that wasn’t worth it. Anyway, I figured if it was working at its asking price, I may as well pick it up for my existing PAL games. Been a long time since I’ve owned a regular old school PS1. And work it does and (you’ve probably guessed this already), it’s also multi-region. That probably means it’s modded, but then burnt CD-R games were never my thing and I’m not about to test that particular functionality.